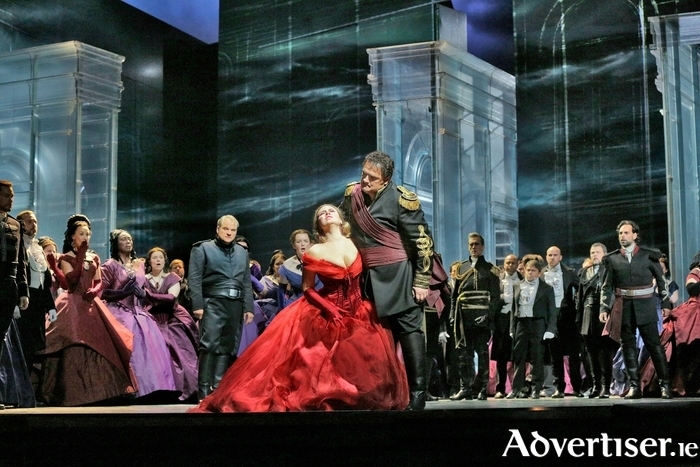 A scene from New York's Metropolitan Opera's production of Verdi's Otello. TWO WORKS by Shakespeare - one by the man himself, another an operatic adaptation by Giuseppe Verdi, being performed in different countries - one in England, the other in the USA, will both be shown at The Eye Cinema. The Met Opera's production of Verdi's Otello, based on Shakespeare’s Othello, will be broadcast live to The Eye this Saturday at 6pm. The opera is regarded as matching the original play for its drama and tragic intensity. It is directed by Bartlett Sher, with music conducted by Yannick Nézet-Séguin. The Royal Shakespeare Company's performance of Henry V will be screened live from Stratford-Upon-Avon on Wednesday October 21 at 7pm. The play, directed by Gregory Doran, charts the build up to and aftermath of the Battle of Agincourt, fought 600 years ago this month. Early arrival and booking is advised through www.eyecinema.ie or 091 - 780078.